You are here: Home / *Articles of the Bound* / Why Do Conservatives Publish Fake News? It’s a common mistake to assume that news stories based on anonymous sources may be true because they sound authoritative. The sheer volume of misinformation is enough to confuse and mislead anyone. Conservative media fall into the trap by too frequently accepting and reacting to what appears in the liberal media. This is why the liberal media maintain their dominance and occupy so many positions of prominence at the Drudge Report. At times like these, it is important to take a step back, especially in regard to the Russian controversy that is being hyped into another Watergate. We at Accuracy in Media (AIM) have published in-depth investigative articles taking apart what the liberal media have reported about Russia, Trump and wiretapping. 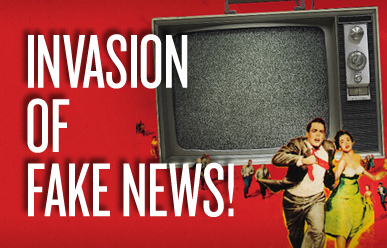 The issue is not false information being given to the President; it’s false information getting into the hands of the FBI, the Democrats eager to exploit the gossip, and the media. Publications like National Review should quit taking their cues from Washington Post and New York Times reports. Their spokespeople should quit spending so much time on Fox News and do some old-fashioned investigative reporting. The primary false or fake news in the Russia controversy has been the so-called “Trump Dossier,” a phony document used by the FBI to guide its investigation, but which has failed to produce any evidence of President Trump’s alleged criminal “collusion” with the Russians. The only evidence of a crime so far consists of an illegal leak to David Ignatius of The Washington Post about former Trump national security adviser Michael T. Flynn. But as Trump says so often, where is the investigation of the leaks? Why isn’t Ignatius under oath before a Senate or House committee? To her credit, on her May 3 show, MSNBC host Rachel Maddow stumbled upon the truth by noting, in her mocking way, that Republicans were suggesting that the real Russian plot involved a firm called Fusion GPS, not Trump and his associates. She raised her eyebrows, as if the Republicans had really gone off the edge. However, at least she hinted at another side to the story. MSNBC hyped the show with this headline: “Maddow: New GOP tactic targets Trump Russia dossier.” We were told that Maddow was covering “how the Republican Party has switched to full push-back mode on the Trump Russia dossier and the overall investigation into ties between the Donald Trump campaign and Russian interference in the 2016 election.” This was partly true. Actually, only a few Senate Republicans, led by Senator Charles Grassley (IA), had “pushed back” in any significant way. There is one critical fact that people have to remember: a pro-Hillary Russia lobbying firm, Fusion GPS, hired a former British intelligence agent, Christopher Steele, to put together a laundry list of gossip, innuendo, rumors and lies against Trump. This was the “Trump Dossier.” It was simply intended to smear Trump. Instead, it became the centerpiece of the FBI’s investigation of Trump. Partisan operatives inside the FBI decided to use it as a political weapon to undermine the President. Tragically, Republican Senator Richard Burr (NC), chairman of the Senate Intelligence Committee, has dropped the ball. He should be investigating the FBI’s malfeasance in the case. Instead, Democrat Mark Warner (VA) is running the show, trying to build a case against Trump. Fortunately, Senator Grassley, chairman of the Senate Judiciary Committee, has picked up the ball and is running with it. He has been uncovering and releasing hard evidence about the Russian active measures operation that has been designed from the beginning not to support Trump but to destroy him. However, he has been demanding, with little success, to find out what the FBI knows about the Russian fingerprints that are all over the “Trump Dossier.” Grassley’s questions could lead to the uncovering of the political operatives in the bureau who were either in on the ploy from the beginning, or else manipulated Comey for their own purposes. Even without the FBI’s cooperation, Grassley has publicized the fact that Fusion GPS and a suspected former Russian intelligence officer-turned U.S. lobbyist had been the subject of a complaint filed with the Justice Department to bring down a U.S. human rights law on behalf of the Kremlin. The evidence is substantial. It should not therefore be surprising that Fusion GPS would work with the Russians again in the matter of the “Trump Dossier.” What is surprising is that the FBI would fall for the ruse. It should have known better. The examples of FBI incompetence or corruption go beyond reliance on the phony “Trump Dossier.” Grassley also raises the issue of an FBI translator who traveled to Syria to marry the ISIS operative she was supposed to be investigating. She served only two years in jail. We not only need a new FBI director, we need a thorough house-cleaning in the bureau that will expose and root out the corruption. Let’s hope that conservative media like National Review will take this matter seriously and quit regurgitating fake news from the liberal media.